The puppy room is just a unique place on campus where there's laughter and smiles and it's just a place where students can some to relax and take a break from all the stressors that are associated with this time of year. 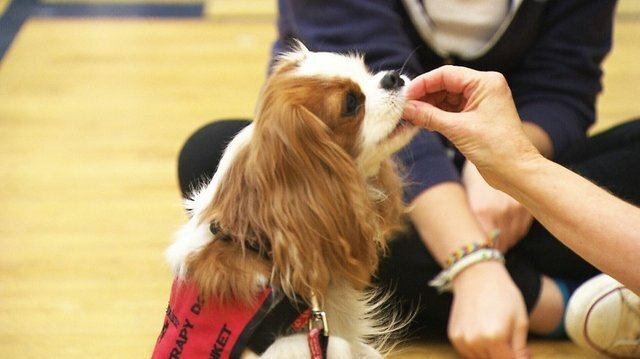 The dogs come from St. John's Ambulance and Therapeutic Paws of Canada, an organization that lends dogs (often older dogs, which are less likely to be adopted) to people in hospitals, retirement homes, and schools with the purpose of providing affection and comfort. The students seem to love it as much as the dogs--"It's amazing what they do for you, they just make you feel so relaxed. They calm all the nerves for exams, it's great," one Ryerson student told CTV News.